Brucellosis is a worldwide zoonosis that has major public health concern in Egypt. 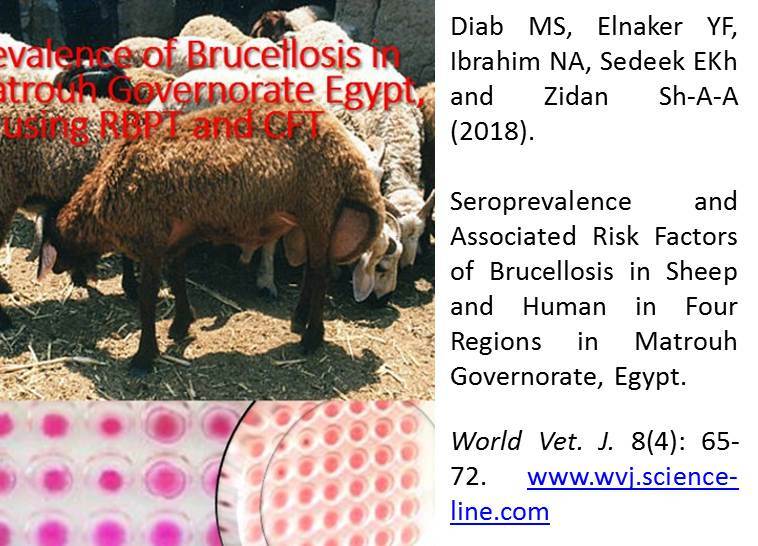 The present work was conducted to investigate the seroprevalence of brucellosis in sheep and human in four localities in North Western region of Egypt, on basis of the Rose Bengal plate test (RBPT) and further confirmation by complement fixation test (CFT). A total of 2471 sheep serum samples and 371 human samples were collected. The prevalence of brucellosis in sheep and human by using RBPT were 11% (272/2471) and 24.3% (90/371), respectively while by CFT were 10.56% (261/2471) and 22.91% (85/371). There was significant relationship between age and in infection rate in sheep (P< 0.01), with higher percentage of infection was indicated in age group over than 24 months by 14.19% (264/1860) followed by age group less than 24 month and over 12 months by 2.39% (8/335). On studying the relation between locality and infection rate there was no significance in human samples while in sheep it was significant (P< 0.01) with higher percentage of infection found in Siwa region by 20.30% (94/463) in sheep and in human by 27.6% (27/98). Concerning season there is highly significant relationship between season and percent of infection with Brucella, the high percent of infection found in human and sheep by 43.1% (62/144) and 16.51% (123/745) respectively and lower percent found in spring months by 8% in sheep. From our result, it is concluded that RBPT and CFT used as screening tests for detection the prevalence of species in serum samples, Brucella infection is found with high percent in north, west region of Egypt, which need further examination and studying another risk factor associated with infection and isolation of Brucella in this area. Club foot deformities were studied in 22 donkeys working in brick kilns. Evaluation of hoof capsule was carried out on hard concrete surface. Changes on the hoof capsule were observed from dorsal aspect, lateral aspect, palmar/planter aspect and distal or solar surface. Dorsal hoof wall angle for each hoof (toe angle) was taken using hoof gauge. According to toe angle club foot was classified into three degrees. The first degree the toe angles less than (<90 ͦ). The second degree the toe angles less or equal (≤130 ͦ) and the third degree more than (>130 ͦ). Club foot in donkeys displayed disparity, increased in heights and lengths associated with contracted heels. The digital cushion appeared atrophied associated with granulomatous inflammations. 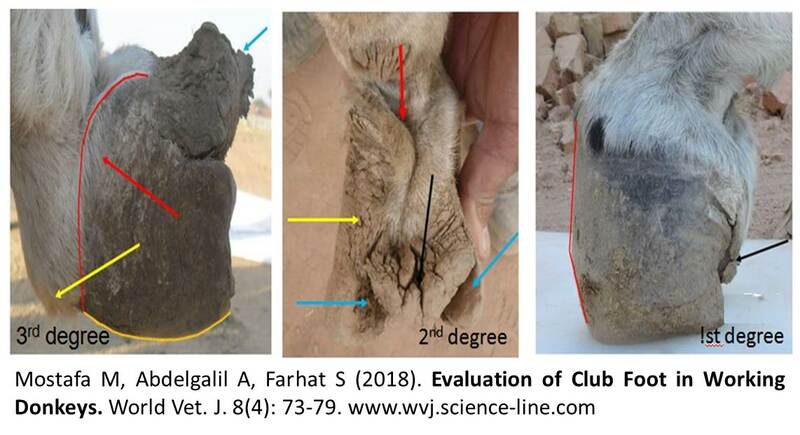 The third degree club foot revealed horn materials of sole, frog and digital cushion were destroyed and covered by hard keratin materials. The use toe angles for classification of club foot provide a reliable method. Radiography of the 3rd phalanx showed osteophytic and osteolytic changes. Soft tissue reaction and thickening with radio-opaque mass and calcification at palmar/planter structures were observed. Overworking, overloading and pain were considered the predisposing causes in brick kilns working donkeys. This study was performed at the governorate of Alkhurmah, Kingdom of Saudi Arabia. Twenty growing Najdi lambs aged six months with average body weight 35.22± 0.107 and 33.67± 0.107 kg for males and females, respectively were allotted based on their gender into two main groups (10 males and 10 females), each gender divided into two subgroups the first subgroup of each gender served as control while the second was supplemented with Lactobacillus sporogenes 37.50×103, Saccharomyces cerevisiae 625.0×103 CFU, 1g Alpha amylase and 20g sea wood powder / kg diet (concentrate feed mixture) for six months. 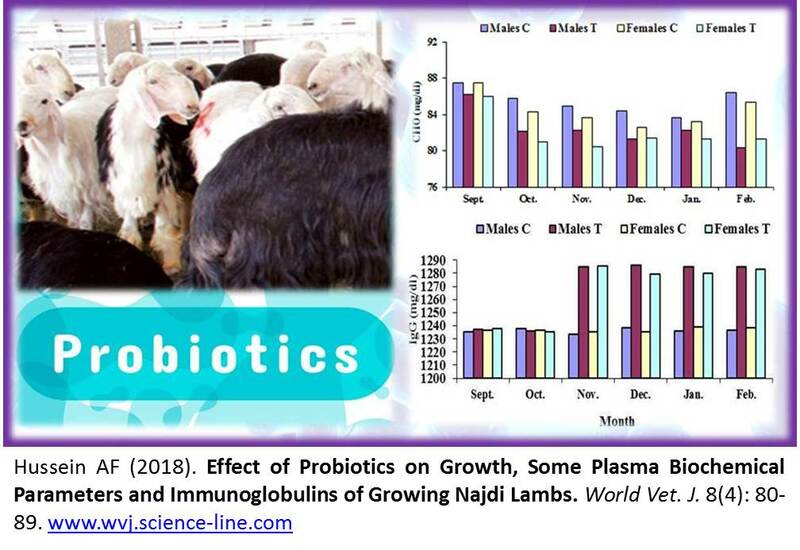 The results indicated that lambs supplemented with probiotics in diet had better improvement (P< 0.05) on growth performance indices (Average daily gain, growth rate and total weight gain) compared with control subgroups in both genders. Probiotics increased (P< 0.05) the values of plasma total protein, glucose, urea nitrogen and aspartate aminotransferase compared with control group. On the other hand, total cholesterol concentration decreased significantly (P< 0.05) in lambs supplemented with probiotics than control groups. The mean values of plasma immunoglobulin A did not differ in both control and treated groups during the study period, while plasma immunoglobulin G increased significantly (P< 0.05) in lambs supplemented with probiotics compared with control groups in both genders. Plasma total lipids and aspartate aminotransferase concentrations remained relatively stable throughout the study period in both probiotics and control groups. In conclusion, probiotic supplementations can be used as the important biological additives for enhancing growth indices and immunity status of growing lambs. 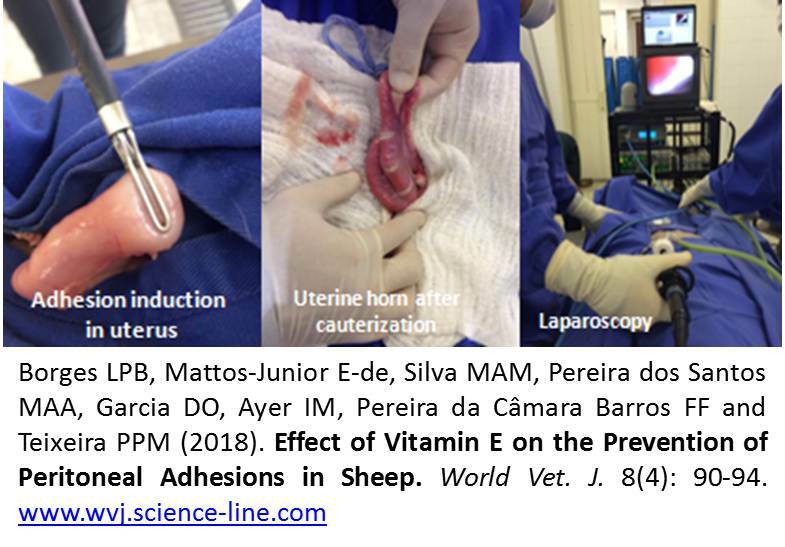 The objective of this study was to assess vitamin E solution on the prophylaxis of intraperitoneal adhesions in ovine uterine serosal damage model with bipolar diathermy. Therefore, 19 ewes underwent laparotomy for induction of adhesions, using a uterine serosal bipolar electrocauterization model. Cauterizations were performed on the right uterine horn serosa and right ovary. Ewes were randomly divided into three groups: control group (GCT, n=5), with no treatment following electrocoagulation, another group using local rinse of 20 mL of normal saline (GNS, n=8), and the last group using local rinse of 20 mL of vitamin E injection solution (GVE, n=6). On day 21 postoperative, animals underwent laparoscopy for scoring and comparison of intraperitoneal adhesion according to frequency and number. The number of adhesions was compared among groups using the Kruskal-Wallis test and Dunn’s post-hoc test. As results, the bipolar uterine serosal coagulation model triggered uterine adhesions in 74% (14/19) of the animals. Frequency of postoperative intraperitoneal adhesions was similar (P= 0.819) among groups (80% ewes of GCT, 62.5% of GNS and 83% of GVE). There was no significant difference between treatment groups, however, number of adhesions was lower in GVE and GNS groups than in control group (P= 0.032), showing that the addition of these kind of substances are better than not using any type of barrier to prevent the formation of intraperitoneal adhesions. Heat exposure is a systemic stressor that adversely influences growth and reproductive performances in cattle. 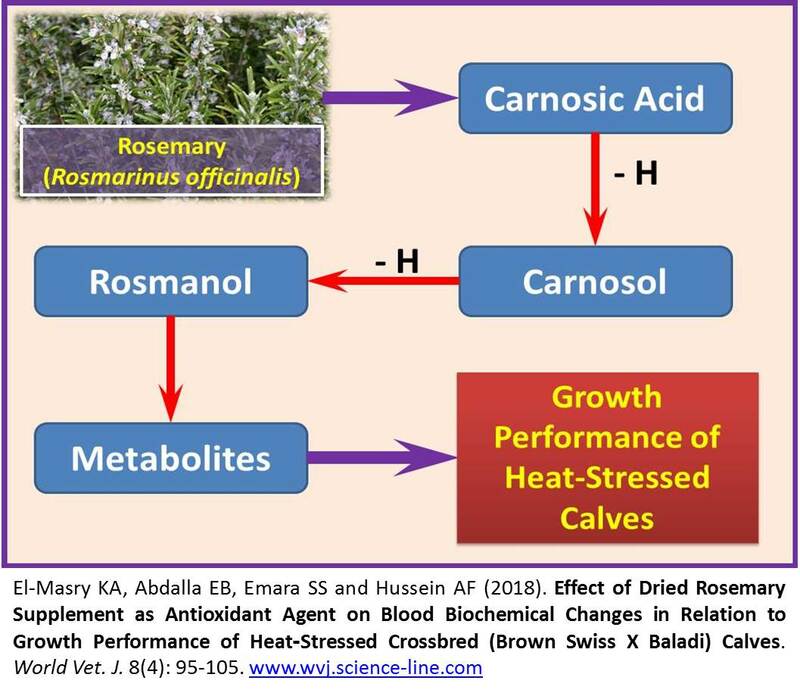 This trial aimed to study the effects of Rosemary (RM) supplementation on reducing the side effect of oxidative stress and its relation with growth performance under heat stress condition. Fifteen male calves were divided into three equal groups, the first was offered the basal diet as a control group, whereas the second and the third groups were fed the same basal diet as in control, in addition to a daily supplement of 3g and 6g dried grinded RM/kg concentrate, respectively, for a period of one month. The results showed that supplement of 3 and 6g dry grinded RM/kg concentrate led to a highly significant (P< 0.01) decrease in oxidant status and an increase in total antioxidant capacity, as well as significant (P< 0.01) declines were noted in the levels of lipids profile, kidney and liver function indicators, and iron concentration. However, RM supplemented groups showed significant (P< 0.01) elevations of feed efficiency and daily weight gain copper and triiodothyronine concentrations. 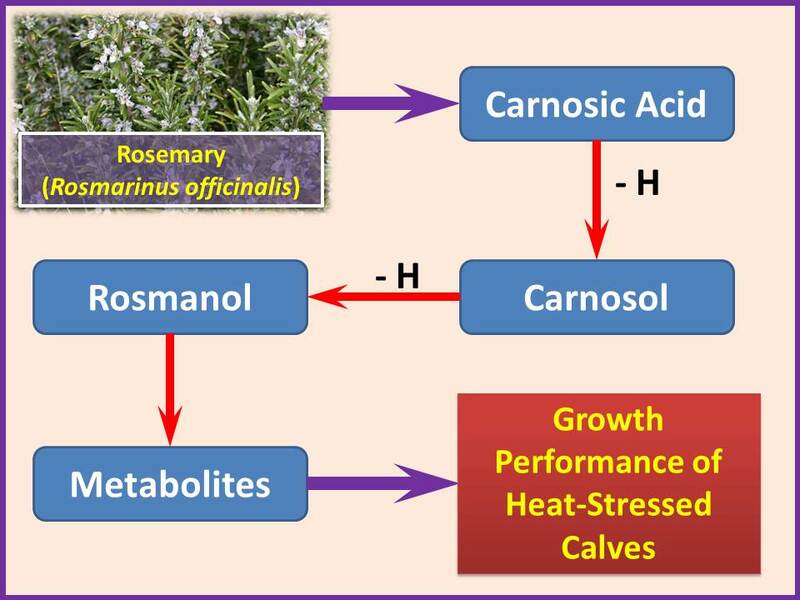 In conclusion, RM improved the calves' growth performance through alleviating oxidative stress side effects under hot summer conditions to improve economic returns. 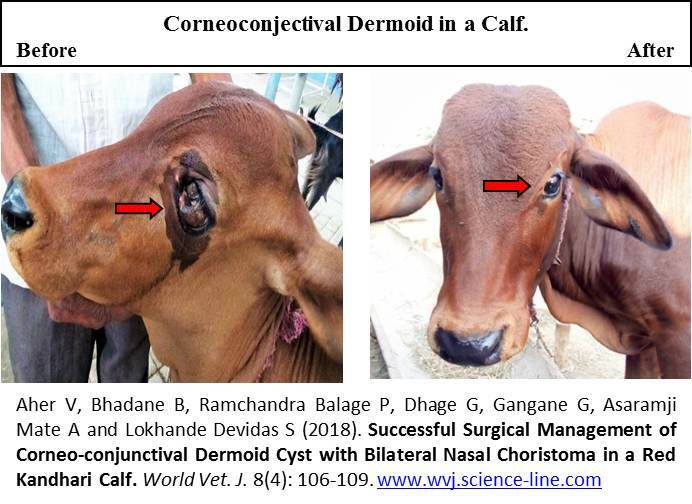 An old Red Kandhari calf presented at teaching veterinary clinical complex, veterinary college Parbhani with corneo-conjunctival haired masses on the left eye and bilateral nasal growth at nasolabial planum since birth. As the mass was completely covering on cornea due to which vision was hindered completely after physical examination and considering the health status of the calf the surgery was scheduled. The masses were surgically excised from the cornea and bulbar conjunctiva of eye and the left and right side of the dorsomedial nasolabial planum. Then the eye was flushed with normal saline and the tissue of both corneo-conjunctival and nasal were stored in 10% formalin later histopathology of the excised tissue confirmed as a unilateral corneoc-onjunctival dermoid with ectopic lacrimal glands and bilateral nasal choristomas with loose stroma and hair follicle. Two months of follow up was done where there was no reoccurrence of the growth observed. Surgery was curative and healing was uneventful.